Global Pumps received an enquiry for a high quality pump capable of transferring copper electrolyte mixture. The mixture, consisting of copper sulphate and sulphuric acid, also had a few suspended solids making it a very abrasive and corrosive media for any pump. Therefore, the client was after a durable pump that could withstand the effects of corrosion and wearing without internal damage. Global Pumps carries a wide range of specialty pumps for harsh pumping applications and when faced with unique applications like this one, engage in analysing a variety of pumps and their specs in order to select just the right pump for the application at hand. In this case, the Global Pumps sales team chose a model from their specialty range of Techniflo Mag Drive Pumps. These pumps are designed for handling corrosive media such as the copper electrolyte mixture, and are made from professionally tested hard-wearing materials, including ETFE (Ethylene tetrafluoroethylene). The pump duty is 90m3/hour at 30m head pressure enabling it to effectively process large quantities of liquid. 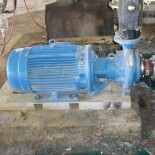 The pump also has a leak-free design as it has no mechanical seals or gland packing and is driven by rotating magnets. This is a huge benefit as it eliminates the need of replacing the wearing seals, encases the liquid and reduces the power needed to run the pump. Techniflo Mag Drive pumps are kept in stock in Global Pumps’ warehouse and the pump was despatched to the customer less than one week after the enquiry was submitted. The Techniflo Mag Drive pump has now been installed for over 3 months and the customer has been benefitting immensely from its efficiency and effectiveness. The ETFE internal body has withstood the corrosive substance exceptionally well and the pump is still performing like brand new.